PGX (PolyGlycopleX) is a novel complex of water-soluble polysaccharides (plant fibers). It was developed after many years of research, most of which focused on the link between blood sugar levels, appetite and weight gain. PGX safely and effectively supports healthy blood sugar levels within normal ranges, reduces appetite and supports weight management. The most important advantage of PGX over other soluble fiber products is that significantly less PGX is required to obtain the same important health benefits, including appetite control and reduced food cravings. PGX promotes weight loss when combined with a healthy diet and exercise plan. Results may vary. Serving option: PGX granules may be added to food such as yogurt, fruit salad, oatmeal or soup. On the go? PGX singles make it easy to take PGX when you are away from home. Be sure to have a few singles on hand at a restaurant, on a plane or at your desk. 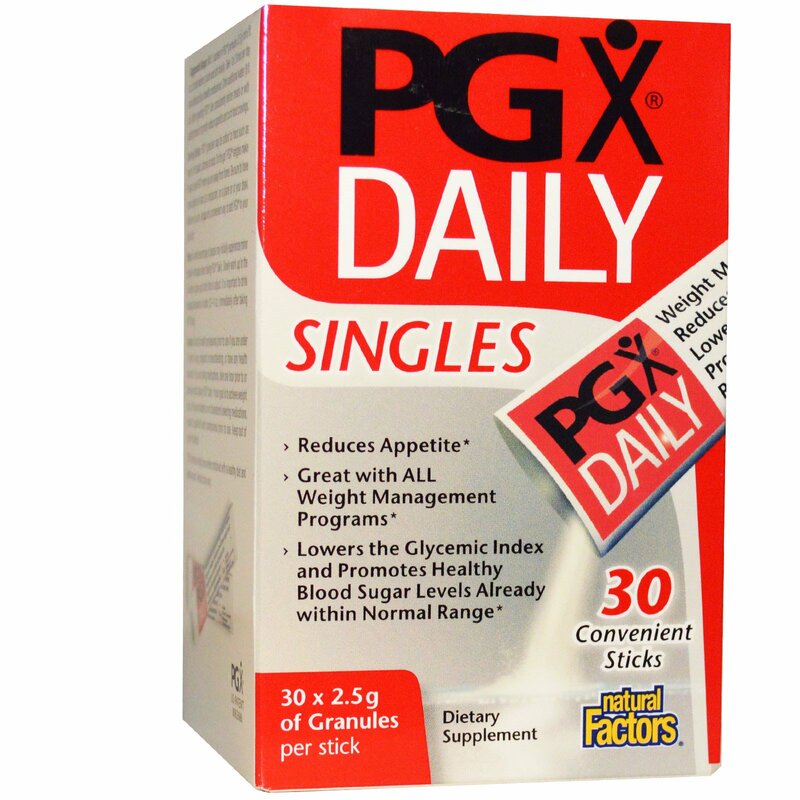 Wherever you are, singles are a convenient way to add PGX to your daily diet. Notice: A small percentage of people may initially experience minor digestive changes when taking PGX Daily. Slowly work up to the full dose to give your body time to adjust. It is important to drink adequate amount of water (12-14 oz) immediately after taking PGX Daily. 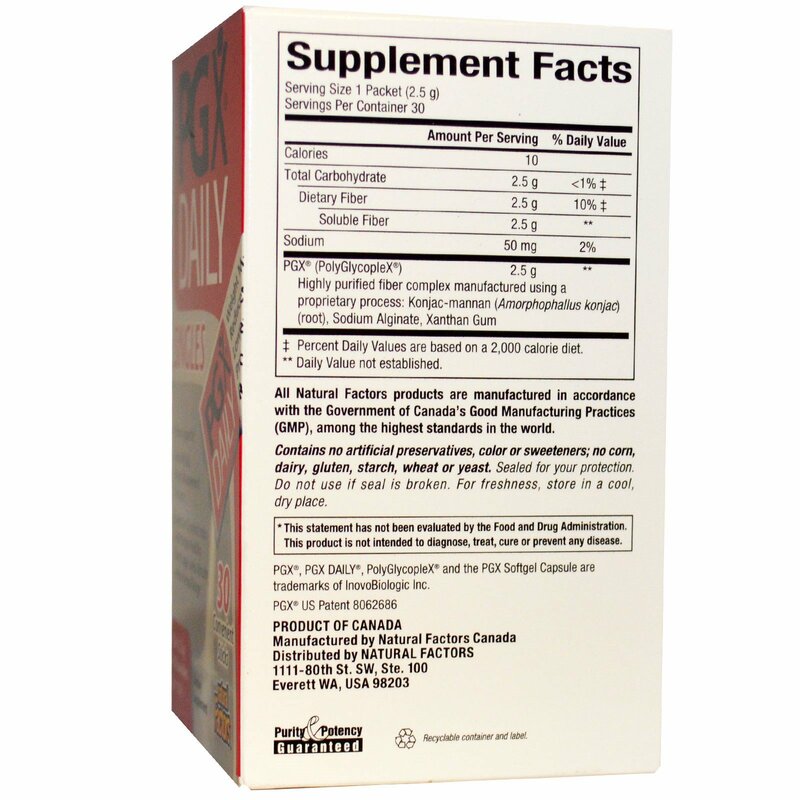 All Natural Factors products are manufactures in accordance with the Government of Canada's Good Manufacturing Practices (GMP), among the highest standards in the world. Caution: Consult a health professional prior to use if you are under 18 years of age, pregnant or breastfeeding, or have any health concerns. If you are taking medications, take one hour prior to or two hours after taking PGX Daily. If your goal is to achieve weight loss, or if you are diabetic or on cholesterol lowering medications, consult a qualified health professional prior to use. Keep out of reach of children.